We stayed the entire month of February 2019. The low monthly rate is the only plus for this place. It’s unkept, dirty, overgrown, noisey, and the staff (not the camp hosts) were rude and unhelpful. 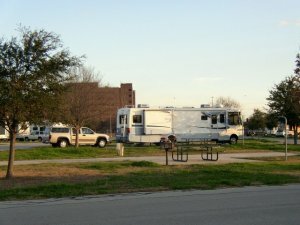 As regular FamCamp users, we understand there is going to be plane or train or gun fire or other noises that come with life on a military base, but this place was the worst we have experienced. The train tracks are just behind the park, and the train comes through from10pm to 10am (yep, you read that right) with horns blowing constantly. The base roads are worse than a lot of dirt roads we have camped on. The gates are a mess and under weird schedules. They are building a new commissary, and it’s a mess around construction. The camp staff were rude and unhelpful for anything we brought to their attention, from broken washing machines to unkept landscaping to need for mail. They play favorites and keep spots for their friends, kicking military families out of their spots (this was confirmed by a camp host). We couldn’t wait to leave, but took advantage of all San Antonio has to offer while there. We will not return to this base.